When I went to last year’s Knitting and Stitching exhibition, one of the things I was compelled to buy with no particular planned use, was a stack of small squares of gorgeously hand-dyed, knobbly, wool viscose felt from one of my faves 21st Century Yarns. This provided the perfect base for one of the cornerstones of traditional Stumpwork, the padded slip. From my little field guide, I knew that the real-life appearance of a Death Cap, er, cap is ‘pale yellowish with a slight greenish tinge’. Lovely. Proper poison colour. 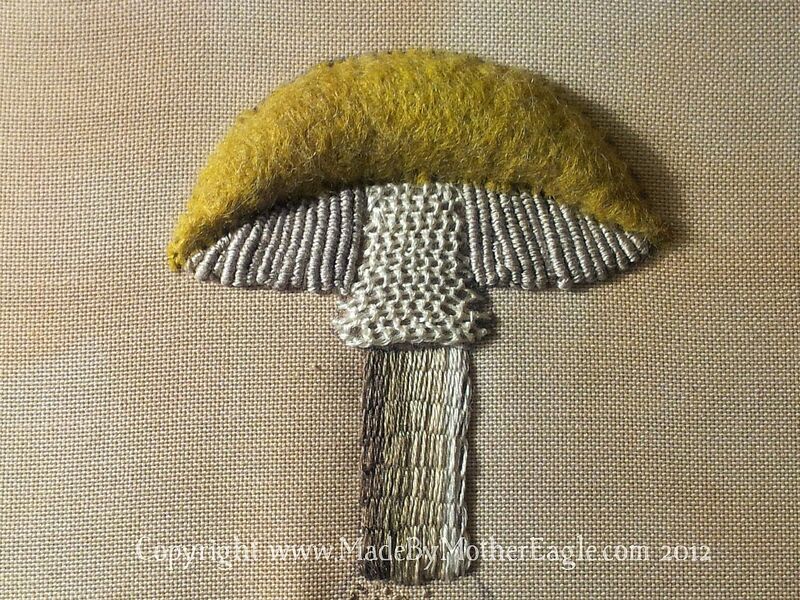 I had used my original drawing to make a cap shape template for cutting out the felt and, making it slightly larger to allow room to pad, I made a few holding stitches around the outside to keep it in place, then stitched around with my Chenille needle, small stabbing stitches. Finally I padded it with recycled cotton fibre. It is lovely. Gorgeous, in fact. You’ve created something poison-perfect. So enchanting and evil. I really like it.